GoRedChef: Journey Of A Foodie Fool: Temple Orange Special: P.S. Tuna With Love! Temple Orange Special: P.S. Tuna With Love! At work we always have to do a special... this time it was with tuna...of course we only get about an hour to come up with one, and plate it up. This is a Spiced Sesame Tuna with Cooling Cucumber Sauce and Baby Greens. Basically I did a spice blend of White Sesame Seeds, Paprika, Turmeric, Cumin, Cayenne, White Ground Pepper & Coriander to give a spicy and nutty crust. Served it with a bed of Baby Greens and Red Lentils Tossed in a light vinaigrette of Lemon Juice and Extra Virgin Olive Oil. 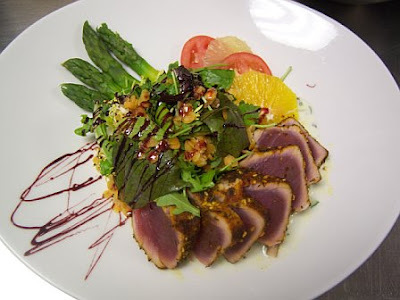 Complimented with sliced citrus fruits, tomatoes and steamed asparagus for a light dish and drizzled with a Port Wine Reduction for a little bit of sweetness to go along with the spicy tuna. I'm all about the asian rule...balancing out all flavors of sweet, spicy, bitter, salty..etc.